Listeners in Germany might want to note these arguments for the digital modes on the shortwave broadcast bands: 1) It is broadcasting, not point-to-point communication. 2) It can be received on any shortwave radio, even inexpensive portables with no SSB capability. (Software is required to decode the text and images, but this can be included in future shortwave radios.) 3) DRM is legal on the shortwave broadcast bands, and DRM can transmit text and images. 4) Text and images via analog radio requires less spectrum (bandwidth) than DRM. 5) Text and images via analog radio are a useful new application for underutilized shortwave transmitters and frequencies. 6) Text and images via analog radio extend the range of a shortwave transmitter, resulting in accurate content in conditions where voice transmissions may be unintelligible. 7) Digital modes via shortwave can be a useful alternative when the Internet is not available due to disasters or to net censorship by dictators. Digital modes on The Mighty KBC (via Germany) and DigiDX (via Channel 292, 6070 kHz, and Radio 700, 3985 kHz, both via Germany) will not be available this weekend for reasons stated above. DigiDX will be available via WRMI, Florida, Sunday at 2130-2200 UTC on 15770 kHz and 2330-2400 UTC on 11580 kHz. 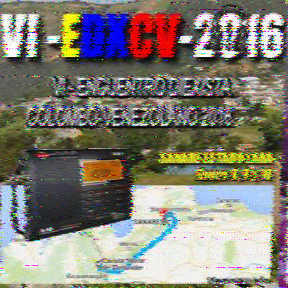 Thank you for your reception reports to VOA Radiogram last weekend. I am now compiling the gallery for program 136 (November 2015) and hope to send it to listeners this weekend.